In the morning, we are going to visit Oriental Pearl TV Tower, the world’s third tallest TV and radio tower surpassed in height only by towers in Toronto and Moscow. Then roaming in Yuyuan Garden, famous classical garden by a government officer in the Ming dynasty. After lunch learn how to make silk in the silk factory. Later on soak in the Bund and Nanjing Road, then take you back to the hotel. Acrobatics Show is your optional choice. After western breakfast at hotel, we are driving to Zhouzhuang and take cruise in water Town. The crisscrossing rivers and the distinctive folk cultures and customs have formed the unique charm of the water towns in Jiangnan area. In the afternoon, our tour guide will take you to airport and fly to Guilin. Your tour will start with Reed Flute Cave, a spectacular world of various stalactites, stone pillars and rock formations created by carbonate deposition. After chinese lunch, take a visit to Sea Pearl Factory. A short walk across Elephant Trunk Hill, as the symbol of Guilin and the main scenic spot of the Elephant Trunk Hill Park. 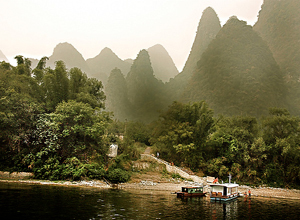 In the morning, we are heading to Li River cruise, the scenery along the river become one of China’s top tourist destinations. Then roaming West Street, the oldest street in Yangshuo with a history of more than 1,400 years. After western breakfast at hotel, we will have Biking tour in Yangshuo Countryside, then visit Moon Mountain and Big Banyan tree. Afternoon, tour guide will take you to Guilin airport and fly to Beijing. This morning, you will visit the world’s largest urban center square, Tiananmen Square. Walk through the square to the Golden Water Bridge, you will enter the largest as well as best-preserved imperial palace complex, Forbidden City. In the afternoon, enjoy some tea in the Teahouse and soak in the Hutong with rickshaw, which let you know the real life of local people. Peking Opera is your optional choice. Today, we are heading to Mutianyu Great Wall, one of the seven wonders all over the world. After simple lunch, pay a visit to Temple of Heaven, which is the largest ancient imperial worship architecture group in the world. Then transfer back to hotel. Chinese Kung Fu Show and Quanjude Roasted Duck Dinner is your optional choice in the evening. In the morning, you will have some free time before departure. Then your tour guide will transfer to airport and fly back to your hometown. *China internal flights: Shanghai-Guilin, Guilin-Beijing.